Another historically compelling, deeply personal novel by Sara Gruen, At the Water’s Edge is a great read. And if you liked Water for Elephants. 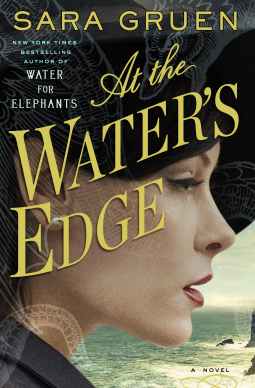 From the author of the hugely popular Water for Elephants comes another poignant historical drama: At the Water’s Edge. Maddy, a carefree and somewhat lackadaisical wife, and her husband, young socialite Ellis, have burnt all the bridges they have in Philadelphia with carelessness and drinking. Now Ellis and his best friend, both who have avoided being drafted into the war, decide to earn a name for themselves chasing the Loch Ness Monster – dragging Maddy with them to Scotland. The Scottish Highlands provide a perfect WWII setting and an distinctive supporting cast. At the Water’s Edge has the perfect mix of plot, characters and prose, not to mention a multi-genre appeal from history and romance to women’s lit or coming of age stories. Gruen has a knack for writing historically compelling, deeply personal novels that leave a mark.